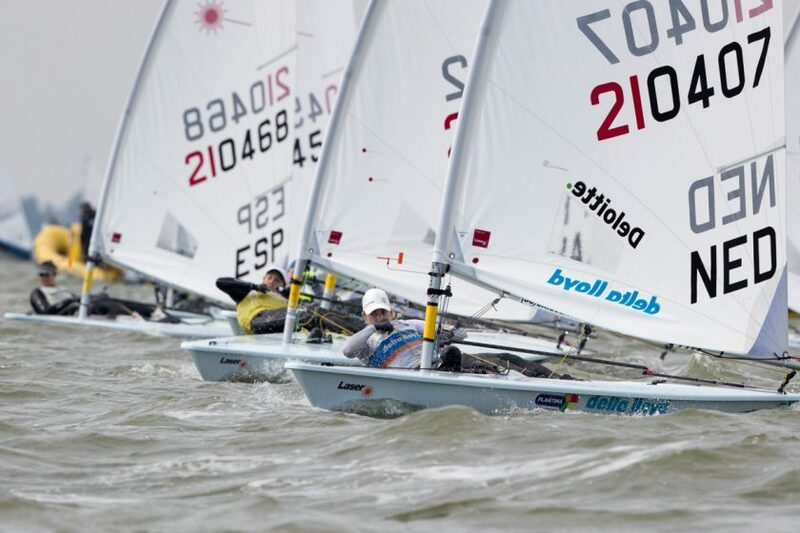 (Medemblik, Netherlands) – All fleets completed two races today at the Laser Radial World Championships in Medemblik. Breeze on the IJsselmeer was a steady 12 knots, creating a decent chop and more challenging conditions for the sailors, after the last two days of light wind. 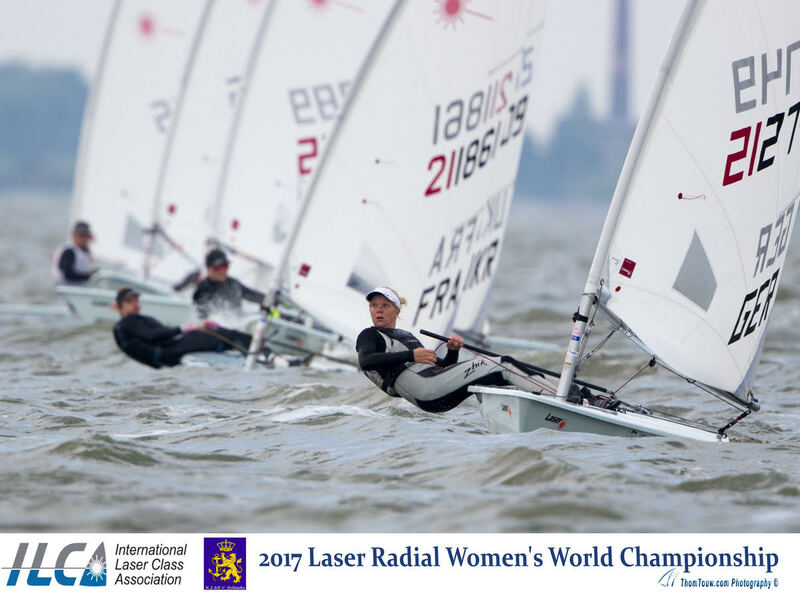 In the yellow fleet, Marit Bouwmeester (NED) found the stronger conditions to her liking and repositioned herself at the front. Off the start of Race 5, Viktorija Andrulyte (LTU) and Bouwmeester were launched at the pin. By the first mark, Andrulyte maintained her leading position, and Bouwmeester rounded in fourth behind Pia Kuhlmann (GER) and Evi Van Acker (BEL). Undeterred, Bouwmeester worked her way forward, and by the final downwind she had the fleet behind her, leading Van Acker to the finish. Andrulyte placed third. In Race 6, Alison Young (GBR) had an outstanding performance as she rounded every mark in first, sailing into a comfortable win ahead of Bouwmeester in second, and Lucia Falasca (ARG) in third. The new conditions unveiled different leaders in the white fleet today, one of which was Germany’s Svenja Weger. Race 5 took off with Manami Doi (JPN) ahead of the fleet after the first upwind, with Weger following in fourth behind Silvia Zennaro (ITA) and Sarah Douglas (CAN). Weger caught up to Doi, as they battled downwind on the final run, and Weger sailed ahead to claim first. Doi placed second with an established distance from of the rest of the fleet. In Race 6, Pernelle Michon (FRA) initially headed the fleet around the first mark, with Douglas and Georgina Povall (GBR) close behind, and Weger rounding in fifth. Weger evidently found these conditions favorable, and worked her way to the front again. By the finish, Weger crossed first, Michon claimed second, and Josefin Olsson (SWE) sailed into third. Overall, Doi and Van Acker are tied for first place with 21 points, as they have maintained top 10 finishes (each with one discard) over three days of racing in very different wind. The key to consistency is “preparation for lots of different conditions, and be prepared for everything,” Doi explained. “I prefer the light wind, but in Freemantle, Australia, I train in all kinds of weather. 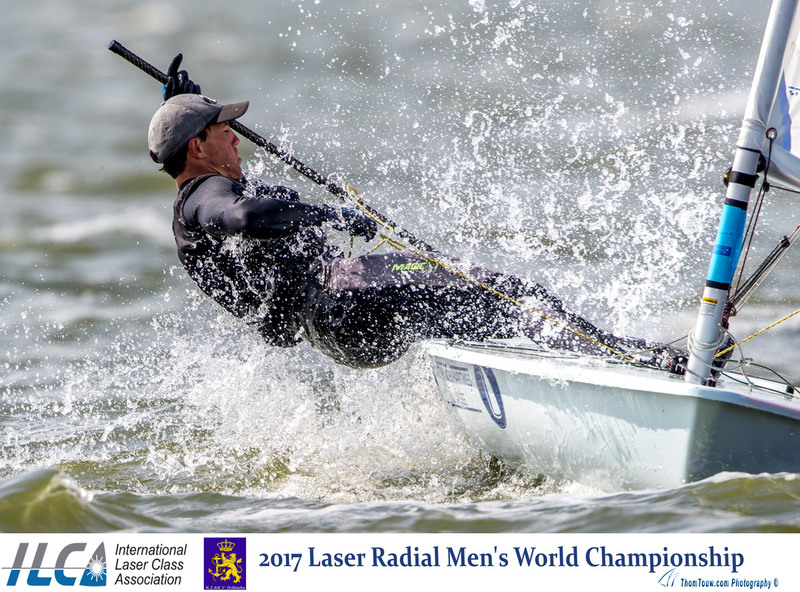 I hiked hard today and I do enjoy the waves in Medemblik.” A sailor who has also adjusted to these conditions, is Weger with 22 points and only one point out of first. In the men’s division, the leaderboard changed with today’s conditions. Eliot Merceron (SUI) used the wind and chop to his advantage as he lead the fleet around the course in Race 5. Maxime Mazard (FRA) and Nik Pletikos (SLO) followed Merceron to the finish, securing a gap from the fleet behind. Race 6 was claimed early on by Marcin Rudawski (POL), who was first to the windward mark. Merceron, not far behind, rounded in second and maintained his position to the finish. Zac Littlewood (AUS) worked his way up to take third in the final race of the day.